Outside-In - what is it then? Outside-In, Enterprise BPM, or Customer Expectation Management, often simply, “Outside-In," is a customer centric approach that requires the alignment of all work towards the delivery of Successful Customer Outcomes (SCO). It is a paradigm shift away from production line approaches, such as Lean or Six Sigma, which see the world through the lens of everything being a production value chain. Outside-In is centred on the fundamental principle that everything the organisation does should contribute to the SCO, otherwise it is potentially ‘dumb stuff’, and open to elimination. As such Outside-In places the customer at the centre of the map, sometimes referred to as the ‘Copernican shift’, moving beyond modelling processes as metaphors for production lines. Outside-In is a business philosophy evolved from previous process based approaches including BPM, Lean and Six Sigma. Outside-In rejects the notion that the all activity should be perceived as a production line, flowing left to right, with customers frequently ‘off the map’ Outside-In provides the practical means to realign the organisation to meet the challenges of the 21st century. Derived mostly from the best practice work of the Leading companies of the 21st century (Towers, 2010) Outside-In includes methods such as CEMMethod , see Customer Expectation Management (Towers, Schurter, 2007) and concepts such as Enterprise Process Maturity, see In Search of BPM Excellence (Fingar, Towers, 2005). Global best practice companies include Amazon, see Working Backwards (Jeff Bezos), Apple, Best Buy, Southwest Airlines, McDonalds, Emirates and Virgin Group. Academic work and books published on the theme of Outside-In includes such Professor Ranjay Gulatti and Harvard Business School, and Outside-In Strategy with Professor George Day Wharton Business School. The global community www.bpgroup.org supports and develops through its partner network the education and application of Outside-In with a specific global qualification the Certified Process Professional (CPP®) and Certified Process Professional Master (CPP-Master®) that establishes the principles and practice within organisations of every kind. As of July 2011 there are more than 15,000+ CPP’s and 3,000+ CPP Masters in 92 countries across 800+ organisations. What is the real difference then? Outside-In is a philosophy, rather than a method in its own right (see this video http://www.successfulcustomeroutcomes.net/2011/04/outside-in-and-its-potential-with-steve.html ). The BP Group helps organisations adopt Outside-In via the CEMMethod®, a structured approach developed over the last decade (see http://www.cemmethod.com for details). The Certified Process Professional® (CPP) and CPP Master® qualifications are delivered globally in more than 90+ countries with 800+ organisations since 2006. In the last five years more than 15,000 people have qualified as CPP's through the Open programme. (See http://bpmbox.com and http://www.certifiedprocessprofessional.com ). What can I gain from gaining Certification? 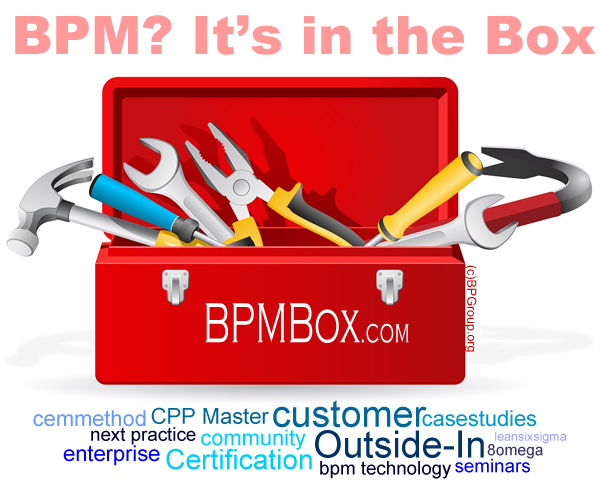 See the Testimonials http://www.bpmbox.com/#testimonials for some of the recent feedback. You may wish to access this selction of 20+ videos that include materials from the CPP program. For a limited time so sign up now and be the first to ebefit from the extensive beta testing program. And to keep you in the loop your BP Group Advisory team is meeting in October so if you have an item you'd like us to review drop me a line please! The BPGroup partner with the worlds leading conference organisers to bring the process community the very best in process excellence, Lean Six Sigma, BPM and Outside-In. Attend great events and continue your learning by earning Continued Qualification Credits in the Certified Process Professional® (CPP®) program. The thread keeps getting bigger! Do you have a quote, or simply want to see the others?